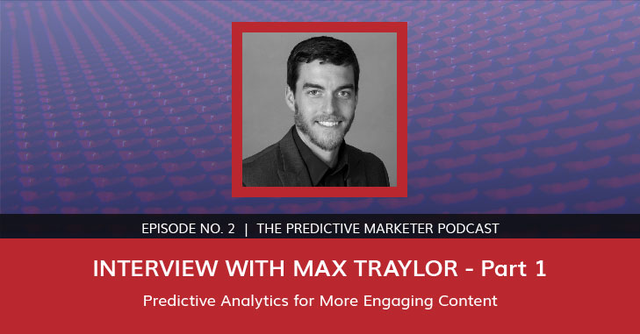 In episode 2 of The Predictive Marketer we discuss predictive content analytics with Max Traylor, and learn how it enables marketers to know exactly what content buyers are most interested in and at each step of the buying journey. Interest data vs intent data (15:20). It's a new era for marketing. Marketers will have to train themselves to ask the right questions (18:00). Next breakthrough: adding mobile data to the mix (19:10). Steve: Max, welcome to the show! Max: Steve, thank you so much for having me. Steve: We met a couple of couple years go in Boston at the HubSpot inbound conference and you were given a talk on content marketing. In fact, the company you were with at the time had a new product that you been instrumental in creating called “Content Marketing Blueprint.” And now, about six months ago, you left and co-founded breakoutrevenue where you employ a predictive analytics approach to content marketing. Can you fill in some of the missing pieces here and tell us a little bit more about your story? Max: Yeah, happy to! Couple years ago, I was mostly jazzed about content strategy. It's the content that is attracting and engaging leads now in growing businesses. So pretty early on, it was clear to me that owning the strategy piece was really where we wanted to be. And over the years, what we’ve found is that initially, our clients would get a lot of great uplift, right? We’d create content, we’d interview the buyers to figure out what they really were interested in. But six or twelve months down the line, we ended up asking ourselves, “All right, what content is really working?” And there was never a real clear answer to it, right? You interview people, you try to figure out what's working. And so what happened was people started to plateau in their results. And I started to look for a more data-driven approach doing content strategy, which is where I started to bump into a lot of the new predictive analytics technologies that are going on. And I wanted to take a side step and really focus on using data to guide content strategy versus, you know, working in content production itself. Steve: Interesting. So tell us a little bit more about the results that you had with the content marketing blueprint. And you mentioned results were really good with that approach; maybe you can kind of explain a little bit about that approach and why you think results were plateauing for you. Max: Yeah, so the whole idea around content marketing is that you really understand what the buyers are going to want at each stage of the buying process and you not only have that content, but you can deliver the content to the right leads at the right time. That's kind of the golden rule of content marketing. And the blueprint was really a way to, through buyer interviews and interviews with the sales team, map out what that process was going to be and what the desires of the buyers would be at each stage of the marketing and sales process, so that your content could be mapped to those stages and distributed accordingly. And that works really well -- to a point, I would say. So what's happening in space is people are investing in more and more content. So think along the lines of two, three blog articles per week that costs a lot of money. And eventually, you run out of things to talk about. And so you start repurposing material that you’ve already talked about or you look at what your competitors are saying or you're following what industry influence are doing. And we’ve found that time and time again, the results, you know, the little green bars that you see on marketing automation platform that shows you're getting more and more leads every month, that would start to plateau. Max: And that would pretty much happen across the board and the general response to that is: spend more money on distribution. Do more content, you know, upping two to three articles per week to six articles per week. That would put a lot of pressure on the content team. That would put a lot of pressure on the people that you are interviewing to get that content. And we started to hear about a better way and really using data to better understand the interests of the buyer and to guide content such that when you hit that plateau, your answer to break through wasn't simply more content but better content and content that was really aligned to what buyers were reacting to at the time. Steve: Right. 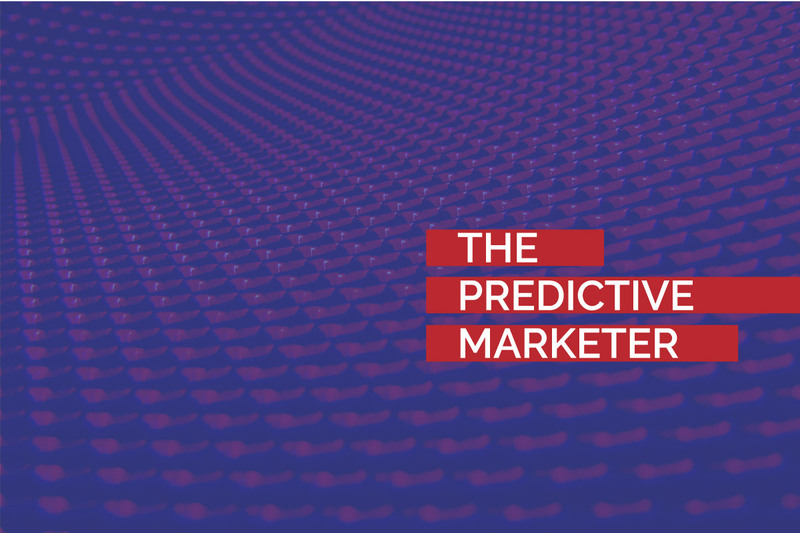 Okay, so how does the predictive analytics approach enable you to get a better handle on what your target market is interested in? Max: I guess the big thing around predictive is data, right? The amount of data available to us on what people are doing on the internet has skyrocketed. And so what that allows to do, first off, I'll say that there's two pieces of predictive: the data that you have access to and then the algorithm that you're using to predict a future outcome. And in the predictive analytics space, you'll find that most of the vendors (say, 99% of them) are focused on lead scoring or basically taking all of the data that we can gather about your buyers about their past behavior and coming up with an algorithm that shows us the buyers that are most likely to buy, right? That's a very specific these use case and that's sort of the step one where all of the predictive analytics vendors that are focused on marketing and sales, that's what they're really doing. And to break through that and to get into content, we have to go a little bit deeper with the data that we're actually gathering. We can’t work off of demographics or firmographics or what people are doing; we have to take a step further and look for data that describes what these buyers are actually interested in. So IBM was doing a lot of work with their Watson platform around text analytics, where they basically use something very similar to what Google does, contextual analysis of content, breaking content up into topics and saying that, “All right, this content piece is ninety percent relevant to topic A; ten percent relevant to topic B,” whatever. So what we’ve found is that text analytics technology was really producing the data set that would allow us to understand what people were actually interested in. Steve: Interesting. So the predictive analytics in this case, to go out there and figure out what the target market is interested in, is primarily what data? Max: It's really focusing on the content itself. So that the first step is to really understand what your content is about, which is that text analytics piece looking at an article and saying, “Okay, I need to build a rich dataset describing what this article actually means, what it says.” And then by tracking users as they read, you know, through you know, basic cookie, automation platforms do that, CRMs do that, by tracking people as they move through this rich dataset, you're now building an interest profile, I’d call it, of that person which describes the topics that they're most frequently interacting with; that they're spending the most time on. And it really gives you a clear view of the topics that that person is most likely interested in, which opens up the door for a lot of strategic analysis. You know, you group different buyers together and say, “Hey, I'm going to look at what my most profitable buyers are actually interested in and I'm going to use that to guide my content strategy. I'm going to look at all the topics that my least profitable buyers are interested in and stop talking about those things.” You can do market segmentation analysis, you know, all the things that you'd want to do as a content marketer that we're now doing, sort of manually, by doing interviews and looking at past performance information. It can really now be done through tracking someone's behavior through that rich content dataset. Steve: What companies are out there actually doing this sort of predictive analytics? Max: It's just now coming from like the enterprise-level down into the middle market. The real pioneers of it, like the text-based predictive stuff, IBM Watson, the whole platform for it again is geared towards enterprise. There's a company in India called Infosys, has a really interesting project going on called the “Consumer Genome Project,” which I love as an analogy because that's exactly what we’re doing, right? We're watching people go through content to figure out what they're actually interested in. So they’ve got a whole project where they're literally mapping out different industries and what topics are actually driving action with buyers in those industries. So, fascinating stuff. But in the middle market, that technology is starting to become a little bit cheaper, little bit easier to deploy in little market firms. And I'd say that Europe is definitely ahead. There's actually not a lot of US companies doing it. Again, most everybody in the space is focused on lead scoring. And there's a couple of reports that are coming out from Forrester and Gartner that are mapping out the predictive analytics space by use case here in the US. Steve: Welcome back to our interview with Max Traylor with breakoutrevenue. Can you define “middle market” in this regard? Steve: Sure. So how long does it take once you get started with a predictive analytics company in this area to actually get actionable results? Max: So, I’d answer that in a broad sense because any predictive analytics solution is going… like, the rate at which a predictive analytics solution can provide value to you will be subject to the amount of data you have. So it's about how many people are on your website or on the properties that you are analyzing. How many people are taking the desired action that you want to increase? So if you’ve got a thousand leads coming in a month, the value is going to be… right away, you're going to have that sample size that really mean something and that the decision makers are going to be confident in. Steve: Sure. Okay, so I'm thinking about HubSpot right now because that's a marketing automation platform I'm familiar with. And you have certain analytics within that software tool that gives you page results, how many people have been on a particular blog post, that sort of thing. So in one sense of this, that would be similar to what we're talking about but it's not the exact same thing. So can you kind of compare those two? Max: Yeah. So if you think about predictive analytics, it's the data that goes into the algorithm is really what is creating differentiated value in the market. It's not the algorithm. Everybody's got machine learning… and you know, you put data into a machine learning algorithm and it will tell you what to do. And on so it's really about what data you have to work with. And marketing automation vendors like HubSpot have done a fantastic job of aggregating a lot of different behavioral data. People are watching videos; they're downloading things; they're attending webinars; they're going to your website; they're searching for things on Google; and all of those behaviors can be really indicative of future actions. Steve: So the contextual analysis of the content that we're talking about is going to give us information totally different than what we've been able to get from CRMs and from marketing automation software. Is that correct? Max: Yes! And a perfect example would be to, you know, take a look at sales persons… sales force, for instance or their CRM instance. I've done a ton of marketing automation integrations and the main complaint I get from the sales team is, “Well, great, I'm looking at the last twenty things this person did but what does that mean to me?” You know, just because they read a blog article and viewed a video and clicked on something, that doesn't really give a salesperson confidence as to how to approach them or what subjects are going to resonate with them on that phone call. So the difference is in behavior, which is what is really mainstream right now and what marketing automation vendors are gathering. And interest data, which is really something that has to be derived, like you have to go out and find a text analytics solution -- and there are many -- but a text analytics solution that will take the title, which is how we look at articles today, and turn that title into a rich data set that describes what that page is actually about. Max: Yeah. Intent data, so intent data is really… well, so there’s interest data and intent data. There's a little bit of a difference. Intent data is basically identifying that somebody is intending to take action. You know, something that says, “All right, this person is really likely to schedule a demo in the near future, thus, we want you to send this person a demo offer.” That is really going to be different than, you know, interest data which is going to describe what that person is interested at a topic-level. It's usually expressed as a tag cloud or a set of topics with a weighted numerical value for each topic, as it relates to that person. You know, you, Steve, you are ninety percent interested in content marketing, you're eighty percent interested in marketing automation, you're ten percent interested in predictive analytics. Steve: Got it. So interest data is really what we're looking at here. Max: That is what I think is going to solve the content problem or at least allow these predictive vendors to start making headway into solving the content problem. Whereas now, everyone's really competing for that top spot in the lead scoring use case. Steve: What would be a couple examples of predictive content analytics providers in the mid-market? Max: For predictive content analytics, sure. So two that come to mind are idio, which is a platform out of London, which has a content intelligence platform. Another one which is more of an SEO-based firm is InboundWriter. So those are two. So it's a little bit new. The technology is there but only a few firms have really developed solutions to directly impact what marketing and sales is doing. And then you've got more point Solutions for text analytics and user tracking, which could be combined to accomplish the same thing. Steve: Wow! That's fascinating stuff. One last question: most marketers were hardly aware of predictive analytics twelve months ago and today, it's in the news every day. So, certainly all companies can benefit from predictive analytics. How do you see the future of predictive analytics unfolding? Max: Well, the most important question to ask yourself when evaluating a predictive vendor is “what do I want to predict?” Right? Because you can even predict anything you want to. It's completely new era and marketers are going to have to train themselves to ask the right questions, right? What is going to drive the most value? Is it knowing what people are interested in? Is it knowing which leads to go after first? You know, we've got a client that's got hundreds of thousands of unused leads and they don't wanna hire the sales team to call all of them, so a lead scoring use case in that regard is very impactful. But ongoing, in the future, where I see this going is, you know, people are going to ask more questions of predictive analytics vendors and that is going to drive more discovery into data sets. Like, what is that new data sets coming down the line in the future? And today, that's mobile. Mobile represents a… you know, for B2B, B2C has already been down that route but for B2B, mobile represents the new frontier of data. You were talking before about the data that you get in a marketing automation platform -- clicks, views, video watches, that sort of thing -- you introduce mobile and people reading things on mobile apps, you know where they are, you know what direction they're facing, you probably know where they went for lunch, you know where they work, you know how fast they're moving. So there's just a lot more information to take in to those predictive algorithms, which will only going to make them more accurate and only going to make them a little bit more scary [laughs] and a little bit too personal, at times. Steve: How long do you think it's going to be before we're going to see that kind of data being aggregated out there? Max: In the next year. It's all happening so fast and so many different firms are entering the predictive analytics space with big backing. It's only a matter of time before these guys go, “Wait a minute, I've got a mobile app, why don't we just slap that onto the front end of our data aggregation tool?” And boom, you’ve got a much more accurate way to analyze people's behaviors. Steve: Max, what is the best way for folks to get in contact with you? Max: max@breakoutrevenue.com or you can follow me on Twitter. I'm doing a lot of tweeting and that sort of stuff @themaxtraylor. Steve: Fantastic. Max, this has been great. Interesting stuff. Thanks for being on the show! Max: Thank you so much, Steve!